Seismically induced accelerations are greatly affected by the transmission through soil layers. The stiffness and damping of the material beneath a structure can therefore influence the seismic loads experienced in the structure. 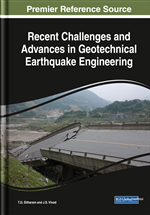 Recently, there has been interest in the use of very low shear stiffness materials in subsoil beneath structures in order to act as a filter to seismic motions, but there is significant skepticism as to its practicability. In this chapter, some notable contributions are discussed, and some work showing the physical modelling and numerical modelling of a soft-material scheme that showed initial promise is presented. This is seen to be readily modelled as a simple mass-spring system, which could be applied to other similar cases. Future challenges include development of a suitable material for the purpose, and reliably proving static stability. Seismically-induced accelerations create many problems for structures on the ground surface. Excessive shaking can cause many types of failure, as summarised by, e.g., Wiegel (1970). Ordinarily, seismic structural design is performed by generating a surface motion for the site soil profile, using a site response code such as SHAKE (e.g. Schnabel et al., 1972), and then using this as an input motion for further seismic analysis. Soil would normally be expected to amplify the accelerations as they are transmitted from bedrock to surface, depending on its natural period (e.g. Iwasaki et al., 1978). Response spectra are commonly used to quantify the effects of soil on the response of single degree-of-freedom oscillators at the surface, for particular earthquake motions. Whether this motion is affected by interaction with the soil would not normally be considered, although recent evidence suggests that such soil-structure interaction can significantly affect structure response, either positively or negatively (Gazetas & Mylonakis, 1998; Ghosh & Madabhushi, 2005; Mylonakis & Gazetas, 2000).